My heirloom tomatoes have finally started to ripen. I wasn't sure if they were going to actually product fruit since we had so much rain for most of May and June. Luckily after lots of attention and pruning my tomato plants are growing like crazy. My oldest son, who helped plant all our fruits and vegetables this year is very excited. He already ate two whole tomatoes like apples for dinner tonight. Even my husband who isn't a big fan of tomatoes had to admit that the heirlooms were delicious. There is something so quintessentially summer about heirloom tomatoes, I love them. Our weather has finally cooled down so even though my tomatoes are in their full summer glory, my house has been much cooler. Even with the cooler temps I have been still using my slow cooker like crazy. 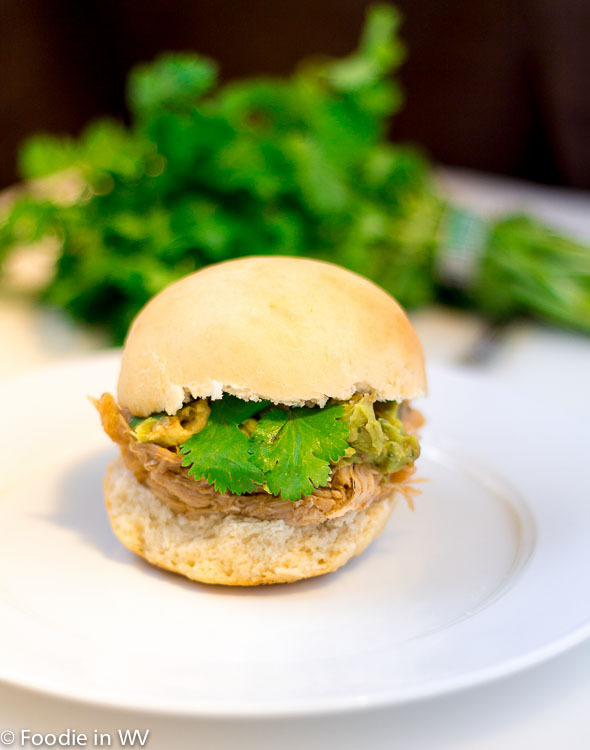 This week I tried a new recipe for Pulled Pork Cemita Sandwiches from the May 2013 issue of Family Circle. This recipe 13 ingredients. It takes 8 hours and 10 minutes of total time, 10 minutes of which is active and makes 8 servings. I did make a few changes to the original recipe. First, I made my own hamburger rolls from scratch. They are much better than store bought and easy to make. Second, I was unable to find black bean spread so I bought black bean dip and boiled it down until it was thickened. For the tomatoes I used the heirlooms from my garden. The pork in this recipe turned out very tender. I added a lot of the liquid back in the pork in order to keep it moist. My husband loved the recipe and ate three sandwiches for dinner the night I made the dish. I ate my serving over basmati rice since I can't eat gluten. If you like more heat in your recipes you increase the chili powder or decrease if you want it milder. My oldest daughter planted a garden with my husband and she loved it. She will also eat tomatoes like apples. Thanks for the recipe link! I think we are serving pulled pork at Lili's birthday, so this will fit the bill! Do have a post on making hamburger buns? Or a favourite recipe? I use two different recipes for buns depending on how much time I have. If I am short on time I use http://www.tasteofhome.com/recipes/40-minute-hamburger-buns if I have more time I use this one http://www.saveur.com/article/Recipes/Homemade-Sesame-Seed-Buns. They are both great! Thanks, Ann! I've bookmarked both these recipes! If you try either of them tell me how they turn out! My tomato plants don't do very good this year...the fruit are still tiny. It is taking my tomatoes longer this year too since we had so much rain. You might just have a huge yield in the fall! I am just starting to harvest tomatoes. So exciting!! I was excited by the first two red tomatoes and then it has taken a while for any more. So yesterday I finally was able to go pick a basket of cherry and grape tomatoes and a couple of yellow tomatoes. That's normal. I get a few at first and then about 30 in a couple of weeks. I planted cherry heirlooms and my kids love them! My husband HATES tomatoes, which I think is odd because he loves pasta sauce and ketchup, but I don't even ask anymore. Those sound yummy. Is it hard to make your own buns? They look really good. It's really easy to make your own buns. I started going it a couple of years ago and it's definitely worth the effort! I am a tomato fiend. I would eat them every day if I could, and I also eat them like apples when I can. The pork sounds wonderful. I have a pulled-pork recipe that is just okay so I might have to give this one a try. My oldest is a tomato fiend too :) This pork recipe really is good! I'm running the slow cooker right now. :) I'm glad you got some yummy tomatoes, and this recipe does look like a good one! We have a late growing season in Colorado compared to yours, so I've pick exactly two pink-ish ripe tomatoes from my 10 plants. This sandwich looks incredible. And with that little bit of cilantro peeking out, I'll have to visit the recipe. Found you on the network blog party ... following you on Pinterest and G+. My blog is Cooking on the Ranch. Hope you take a look. I love pulled pork. Living in NYC I wish we had space for a garden. When I lived out in the burbs I had a nice one going with all kinds of veggies. I could just eat tomatoes plain like an apple with a little salt on them. It's hard when you don't have any space. I lived in tiny apartments in Seattle and never had any space either. I love pulled pork too, it's yummy! this sounds delicious. i love pulled pork sandwiches, especially BBQ pulled pork! glad to hear your tomatoes are doing well! I'm a big fan of pulled pork too, it's delicious!